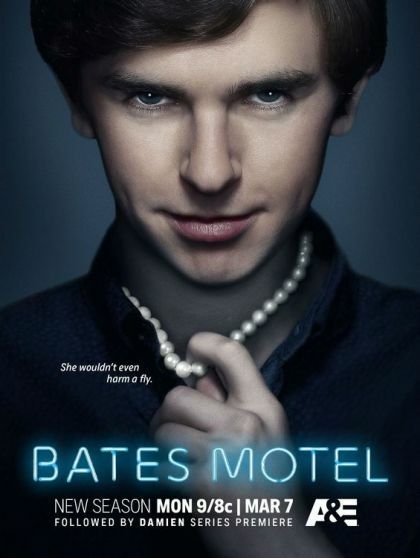 After the death of her husband, Norma Bates buys a motel in the picturesque coastal town of White Pine Bay, giving herself and teenage son Norman a chance to begin anew. Shy Norman is reluctant at first, but with the help of his mother -- with whom he shares an intensely close relationship -- the boy begins to open up to others and make new friends. Some locals, however, aren't as friendly and welcoming to the Bates, who discover that because White Pine Bay isn't as peaceful as it appears, they are forced to do whatever it takes to survive. As the fourth season opens, Norma searches for Norman, who finds himself in unfamiliar surroundings. Dylan waits for news about Emma while Romero gets a surprising proposition. Norma and Norman each suspect the other in a terrible deed; Dylan contemplates his future with Emma; Romero makes a choice that drastically impacts the Bates family. Norma and Romero takes a big step together; Norman attempts to accept his new surroundings; Dylan tries to shed old business. Norman and his new friend have an adventure; Norma experiences her first taste of real happiness in some time during an annual festival in White Pine Bay; Dylan becomes caught between two families. Norman tries to confide in Dr. Edwards, but worries he may reveal too much. Also: Norma hires a craftsman to fix a window and Romero uncovers a crime that threatens his new life. Norman uncovers painful truths as his therapy progresses; Norma works to prevent a secret from being revealed; Romero assists an old friend despite the risk to his career. Norman returns home after making an unanticipated discovery; Norma takes on new projects; Dylan's search for Emma's mother leads to disturbing results. Norma is torn between Norman and Romero; during a holiday outing, Norman comes to the realization that everyone has changed while he was away. Norman plans a special event for Norma; Romero faces pressure due to his actions; and Dylan considers reaching out to Norman.